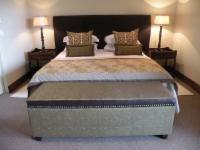 Luxury accommodation is offered in one unit with two beautiful rooms, each with their own entrance and patio. Each room has a queen-size bed, a bathroom with a bath and shower, as well as a kitchen area with a microwave, fridge, kettle, toaster and cutlery. The cosy rooms are equipped with full DStv and underfloor heating, and breakfast is available on request. Horse riding, game-viewing, quad- ike trips, fishing and hiking trails are all within a radius of 3 km. Nice place but a bit further out of Clarens than expected. Fantastic breakfast and lovely gardens. Andes Clarens Guest House & Wedding Venue is 6.1km from the centre of Clarens , the nearest airport 144.3km (Moshoeshoe I International Airport).